Steve and I are HUGE fans of Sushi and will buy some for lunch a couple of times a week. I hate that we don't have a Sushi bar in Cramlington where I live as M&S Sushi just isn't the same as the real deal (YO! Sushi if you are reading this - please come to Cramlington! lol). 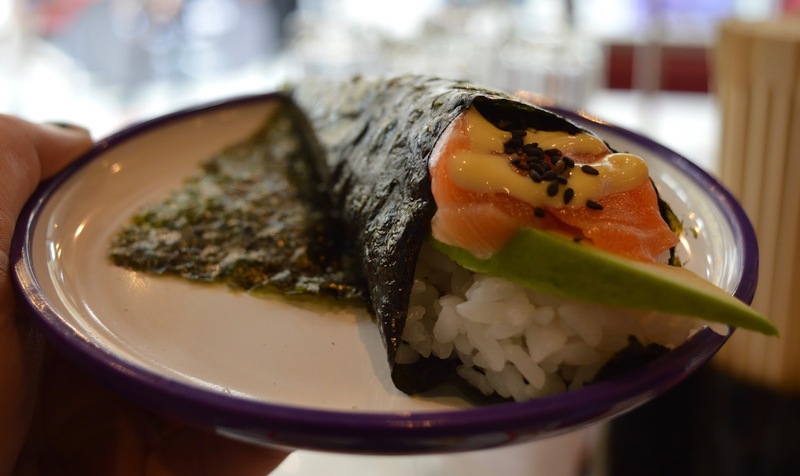 When in Newcastle we will often eat at a Sushi bar and after visiting the new YO! Sushi on Grainger Street during their launch party, I was dying to take Steve. Date nights are few and far between at the minute though so when I received an invite to dine at YO! Sushi, I tentatively asked if I could bring the kids along too. It was a big fat yes and we were told that YO! Sushi was fantastic for kids and they'd be made to feel very welcome. We have actually dined at YO! 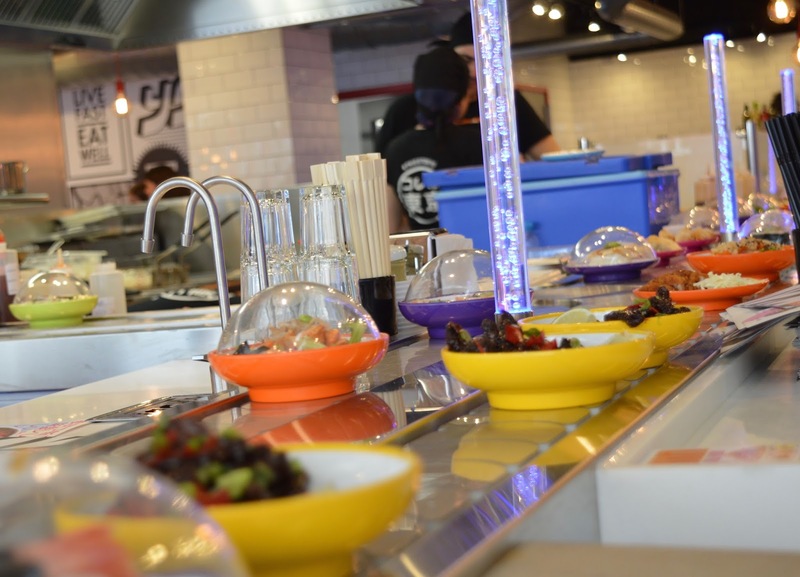 Sushi Metrocentre with the kids a couple of times before and they loved it - it's quite a novel concept being able to watch your food pass before you and take anything off the belt that takes your fancy. You will find YO! 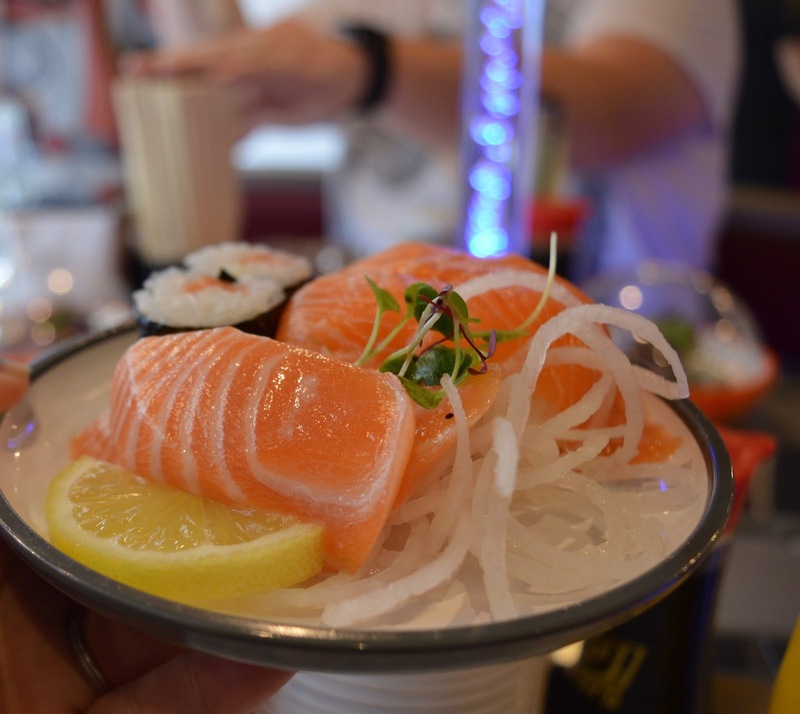 Sushi on Grainger Street a few steps from Greys Monument so it is very well located. 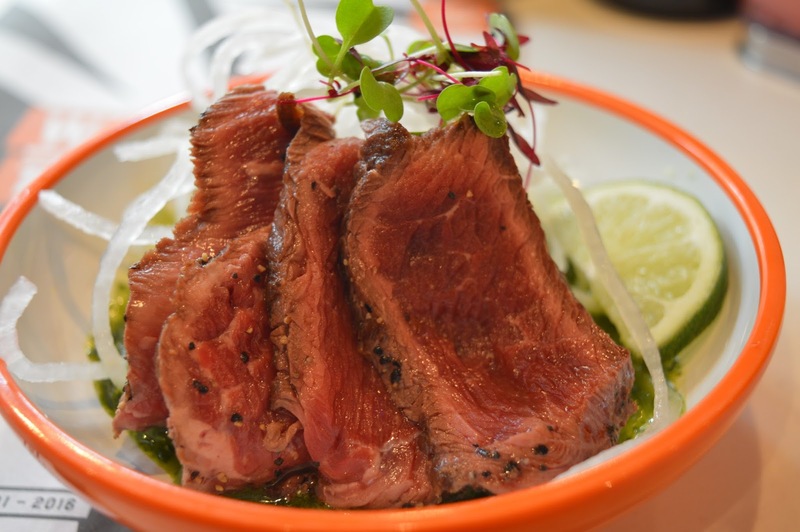 The flagship restaurant is bright and vibrant with neon signs and bold statements. You honestly do feel as though you could be sitting in the heart of Tokyo. The restaurant is lots of fun with a range of seating from booths to bar seats or a rather exciting window booth where we were which I think has to be the best seat in Newcastle for people watching. There are highchairs available too. We visited YO! Sushi when Jack was a baby and weaning and think that YO! is fantastic for weaning babies as a lot of the food fits perfectly in their hands. If you've never visited YO! Sushi before the staff will happily go through everything with you but basically, you are given a menu with pictures of dishes and descriptions (very handy for kids to see the pictures). When you are ready to order simply press the 'call' button on your table and a member of staff will be with you ASAP. We ordered a couple of dishes at a time as didn't want to over-fill ourselves. You can press the button as often as you like and the staff are always happy to answer questions. 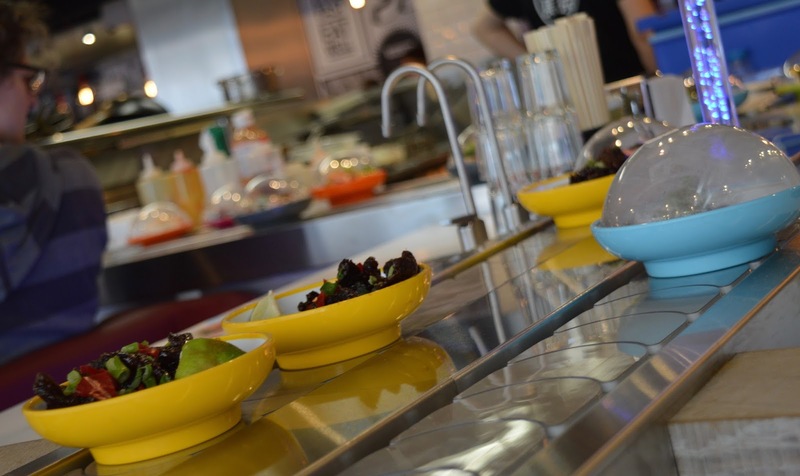 As well as ordering from the menu you can also pick any plate from the moving conveyor in front of you which is fantastic for kids as they get to see the food before deciding whether they are going to eat it or not. 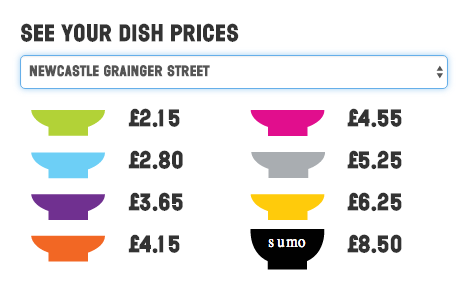 Every plate is colour co-ordinated and every colour corresponds to a different price. At the end of your meal, your empty plates are added up to give you your total bill. A word of warning - the food is VERY tempting as it passes in front of your eyes and I would set yourself a limit before visiting as it's very easy to get carried away. Help yourself to wasabi, soy sauce, unlimited water (small charge) and chopsticks/cutlery from your table. 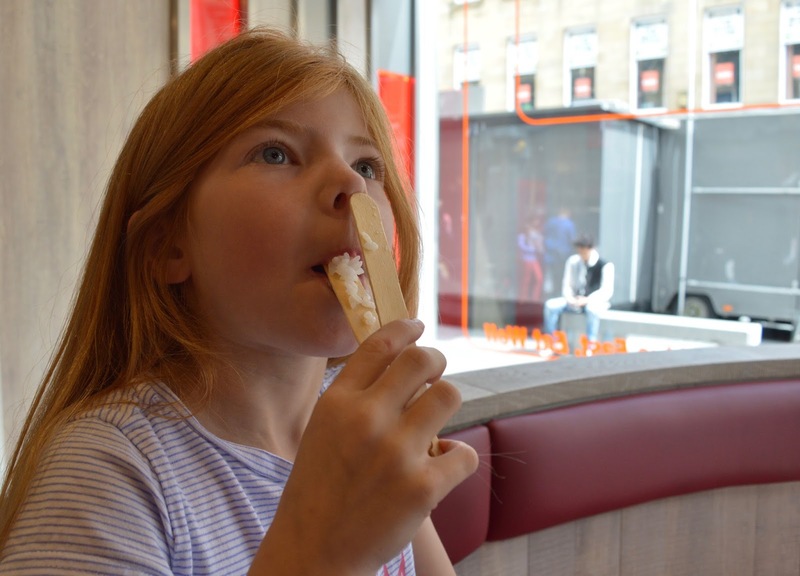 Child-friendly chopsticks are available and super easy to use. 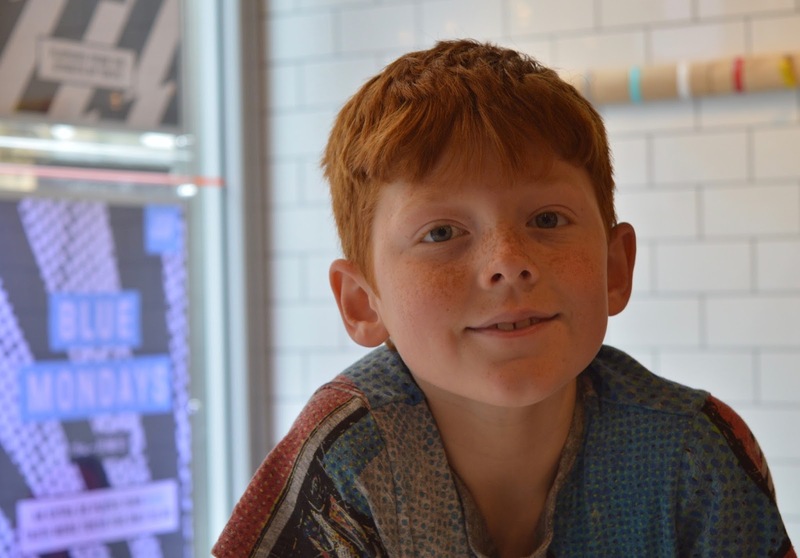 Our children are sometimes picky eaters and other times they will surprise us and try new foods so we always find it best to start with a few bland items they are used to and once they get a taste for it, they will happily dig into other food too. Okonomiyaki - Hot on the food scene in Tokyo, Okonomiyaki is a popular street food consisting of batter and cabbage served with a variety of toppings. Okonomiyaki translated into English means "As-you-like-it Pancake". Full of flavour, YO! Sushi’s Okonomiyaki is topped with mayo, katsu sauce, spring onion, aonori, beni shoga & katsuoboshi. 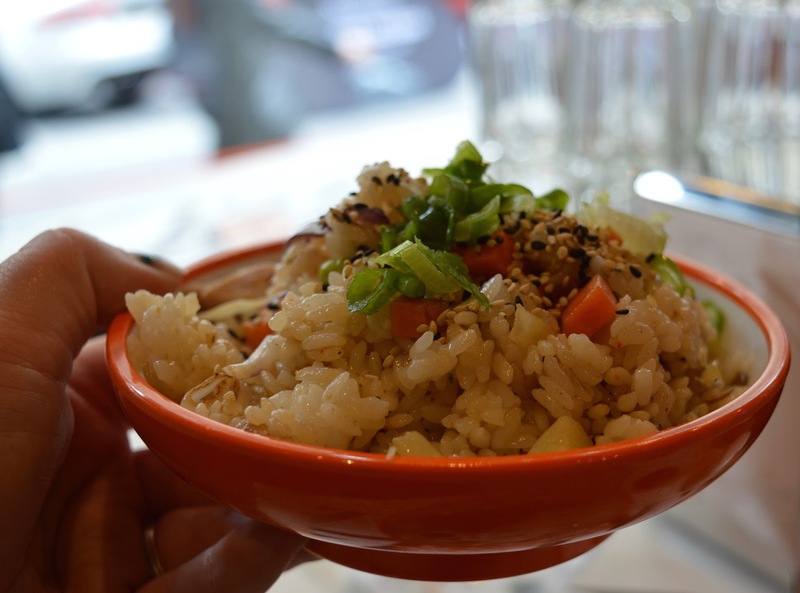 Chazuke - A traditional Japanese rice dish made with green tea, Chazuke has been served in Tokyo for centuries. 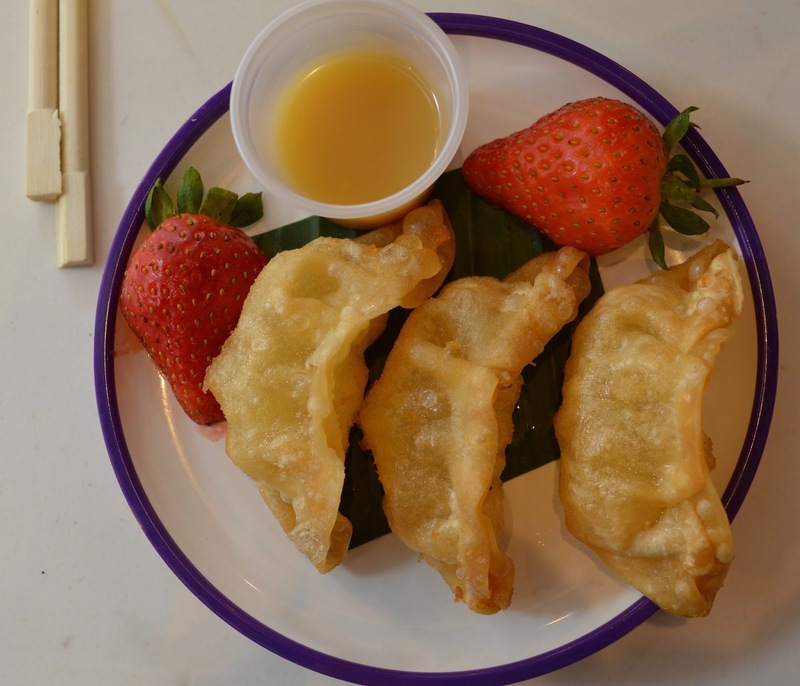 It is the simplest of pleasures and is now available for the first time at YO! Sushi where it is served with nori, sesame paste, salmon & sea bass, oba leaf, yuzu koshu furikake seasoning & umami dashi. Ginza Roll – As exclusive as the district it’s named after in Tokyo – this new roll contains fresh salmon, cream cheese, cucumber and arenkha caviar. Finished by rolling in crispy shallots and drizzled with teriyaki, sriracha & Japanese mayo. 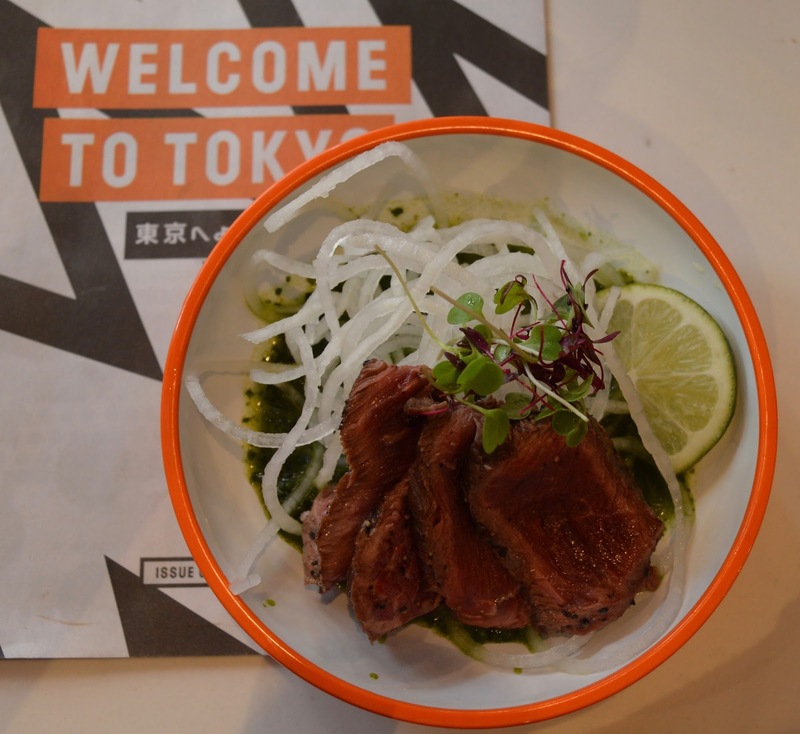 Buta No Kakuni - A Tokyo classic! Always the first thing our group executive chef orders in a restaurant, try this slow braised pork belly and daikon in a sweet soy sauce with rice. 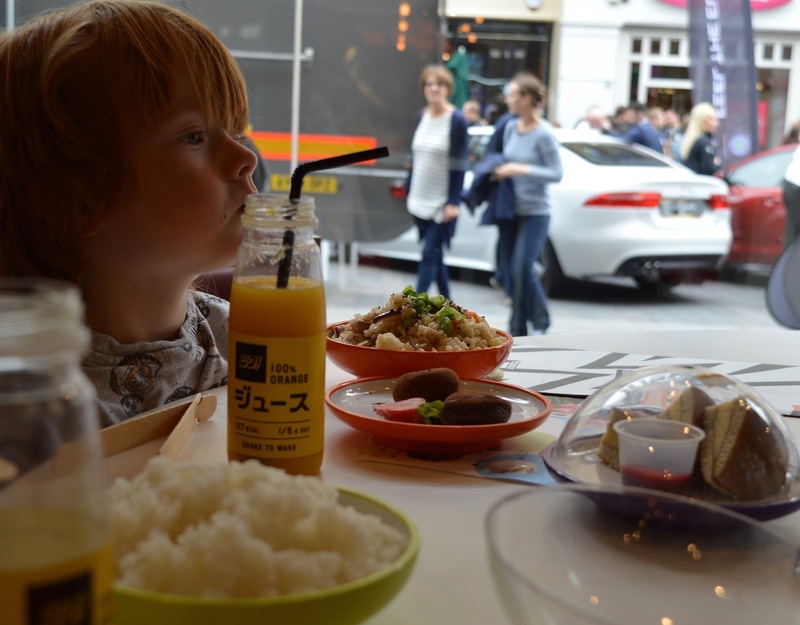 Our children adore the chicken rice at YO! Sushi and it's a nice dish to start with if this is their first trip. A visit to YO! Sushi can seem a little daunting at first as there is so much choice. 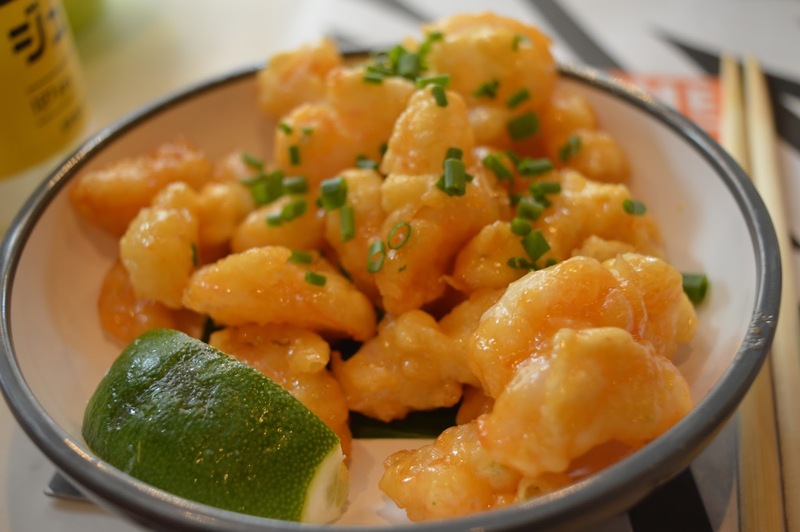 Our server recommended this Popcorn Shrimp Tempura which was drizzled with a sweet Miso Butter Sauce and it was incredible - easily my favourite dish. If you are stuck with where to start, don't be scared to ask for recommendations. The staff are very friendly and really know their stuff. I think we ordered 11 savoury dishes between the 5 of us to share. The kids wouldn't touch the sushi (all the more for Steve and I so I'm not complaining) but did really enjoy the squid, chicken rice, teriyaki chicken and prawn dishes. The problem with dessert passing in front of you on your conveyor is that the kids wanted to pick chocolates straight away! We made them wait though and the promise of chocolate was a good carrot to encourage them to eat their mains. 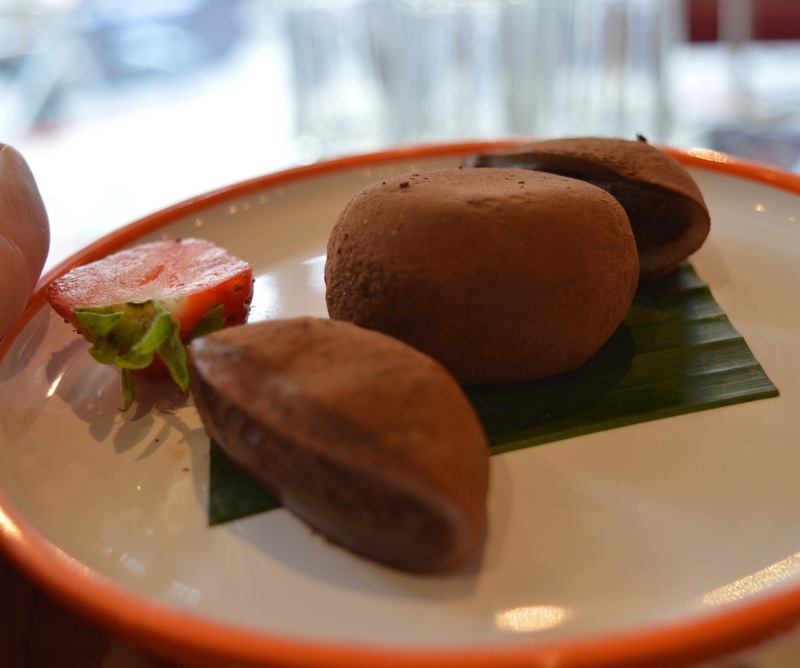 The kids ordered Chocolate Mochi which are Sweet Rice Balls filled with a chocolate ganache. By the time we ordered dessert, they were quite happy pressing the call button and ordering themselves. We also picked Custard Dorayaki from the conveyor which is kind of like a custard cake sandwich. No pics as it didn't last long but it was delicious. Our server was again spot on with his recommendations and advised Apple Gyozo and Salted Miso Caramel. Wow these were gorgeous and tasted like mini apple pies but without the stodginess. Perfect! Every Sunday at YO! 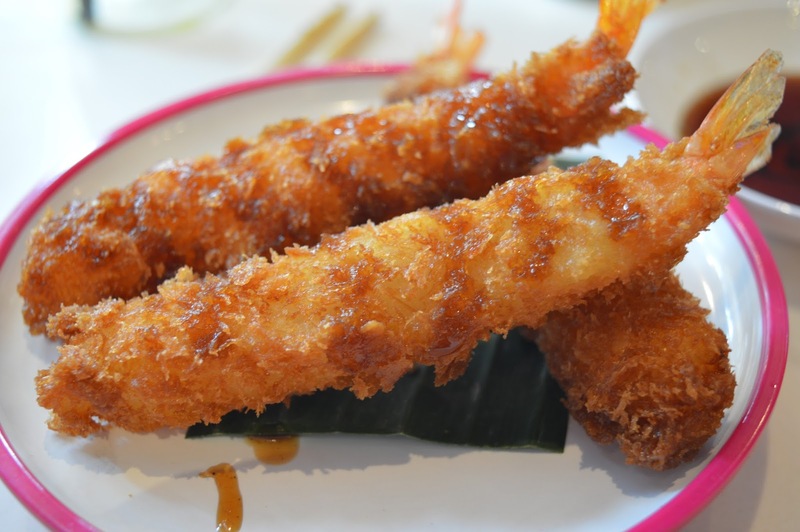 Sushi, adults can order 10 plates from the menu or conveyor belt plus enjoy unlimited Miso Soup for just £20 and kids can order 5 plates for just £10. This is an AMAZING deal. Personally, I'm not sure I could manage 10 plates so will be saving this for a time when I have a looooong afternoon free and can stretch the deal out across a couple of hours. This deal would cost a family of 4 just £60 excl. drinks which for 30 plates is honestly incredible value (exclusions apply see website for details). If you have big appetites I would say, go for it! We left YO! Sushi full to the brim. 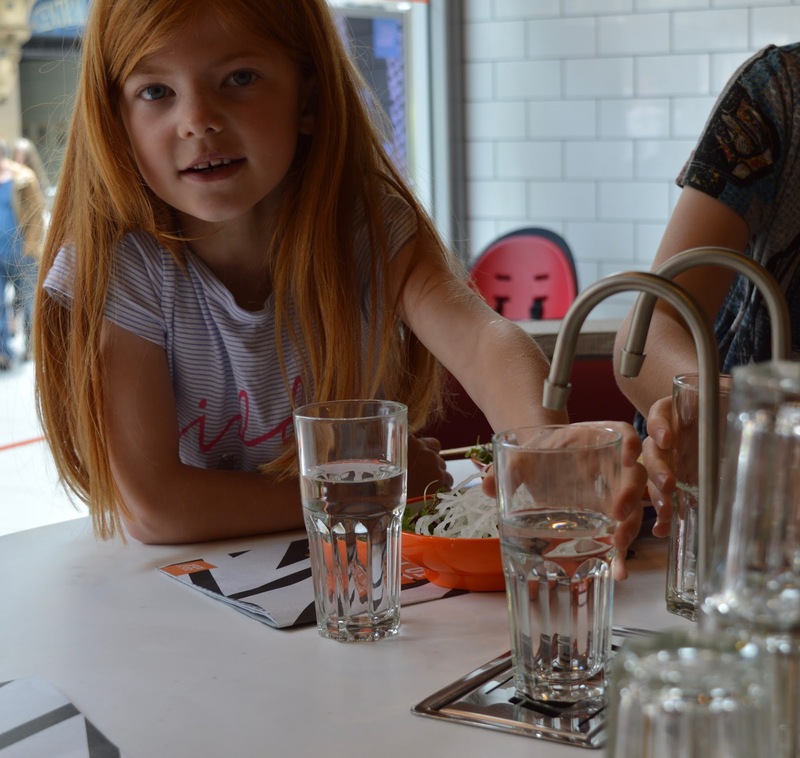 I was happy that the kids had tried new foods and we'd enjoyed a unique style of dining experience together, the kids were happy as they enjoyed picking their own food from the conveyor belt, pressing the call button to order a dish from the menu and helping themselves to unlimited water with the tap that was built into our table (a novel concept - maybe I should try this at home?). Steve was happy as he just loves YO! Sushi and a lot of the food is nice and healthy/low calorie so it fits in perfectly with our new healthy eating regime. 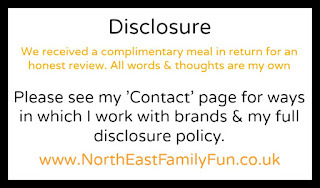 If you are looking for somewhere new to dine with the kids or perhaps fancy something completely different to traditional Sunday lunch, I would recommend giving YO! Sushi a try. 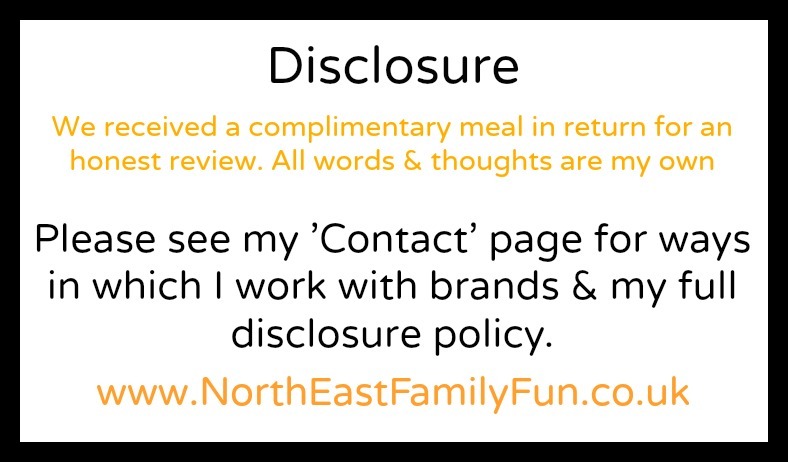 Enjoy eating out? 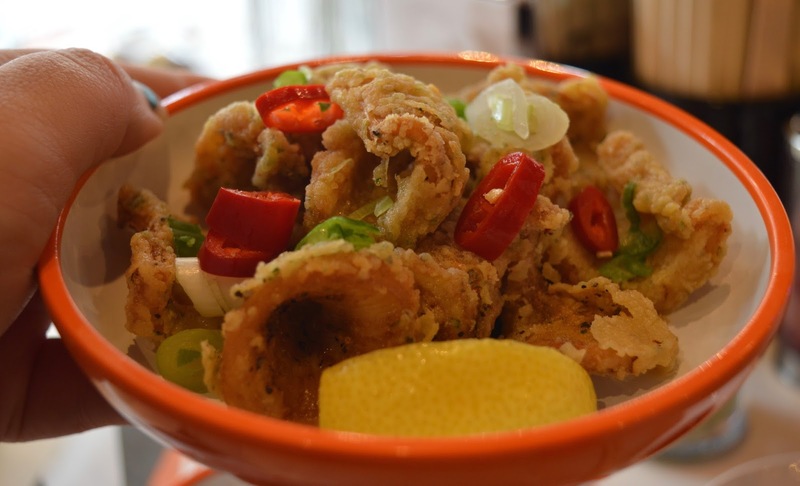 Why not join our North East Food Lovers Facebook Group? Yo! Sushi is so fun - love it for a quick lunch get-together! 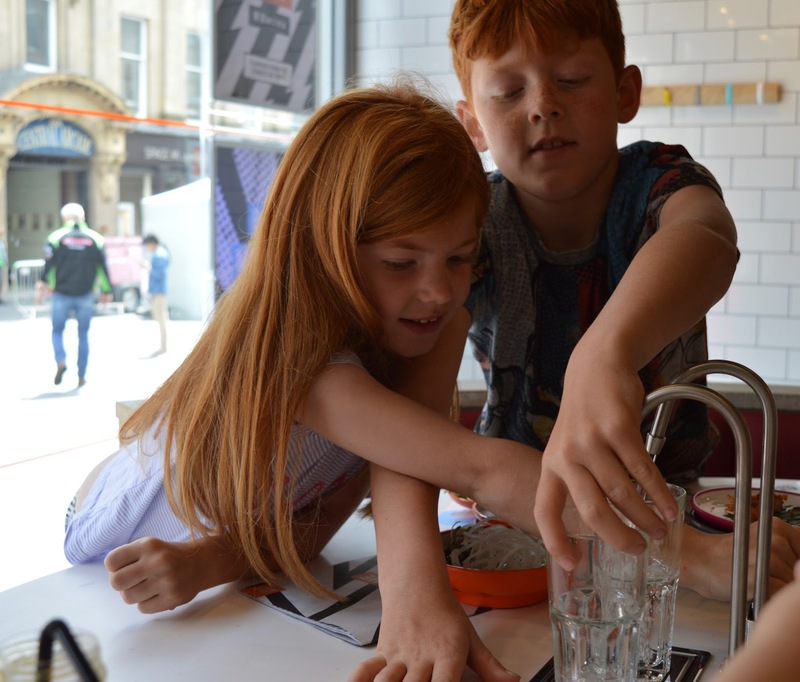 I always find Yo Sushi so much fun, so I bet the kids loved it. We shall definitely be visiting during the school holidays. Sounds like my son would love it. The food looks amazing we have never been to Yo!Sushi before its great that you can see what the food is like before hand. 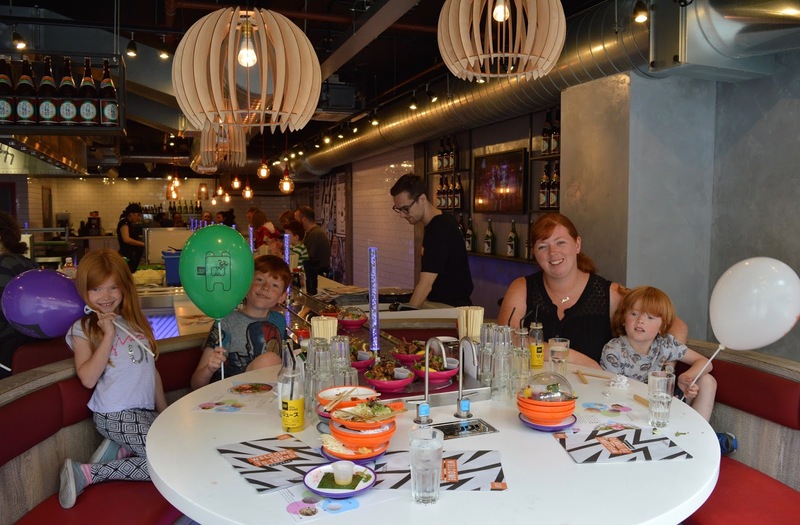 We love Yo Sushi here and I agree that it's great for weaning kids. They have great highchairs too. Maki is perfect for popping on Lena's high chair tray. They used to give complimentary white rice bowls for little ones too and the rice is sticky enough for them to pick up with their hands. Arlo loves using the kids chopsticks. Love it! oh, my kids love sushi. I never thought they would, but they do. They love the habachi places too. 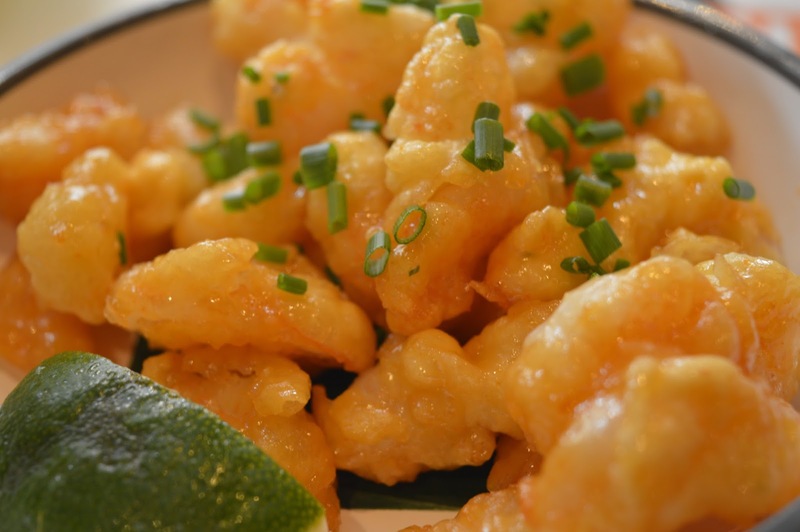 I think trying some new dishes here with the family would be fun. It's nice they have plenty of dishes kids will like. 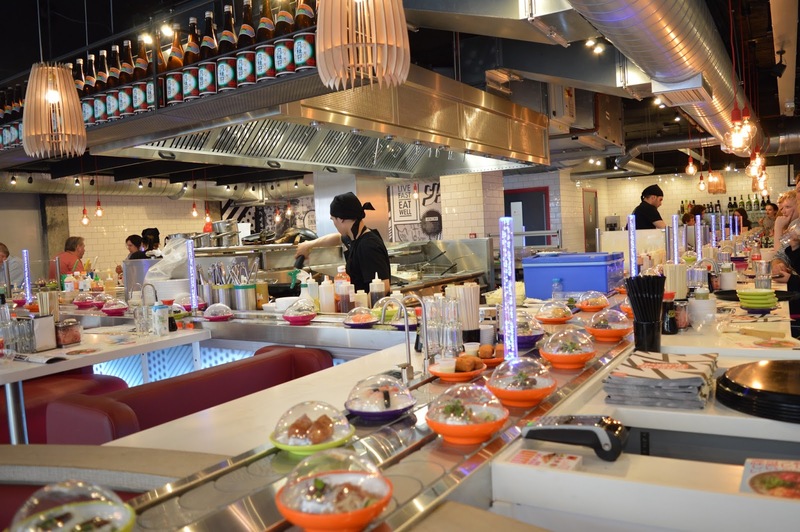 I bet kids love Yo Sushi, as it's such a fun eating experience. I have never eaten here before but my Dad loves it! What a super sounding restaurant! Love the colour coded plates, love the menu, love it all! I have to visit here! 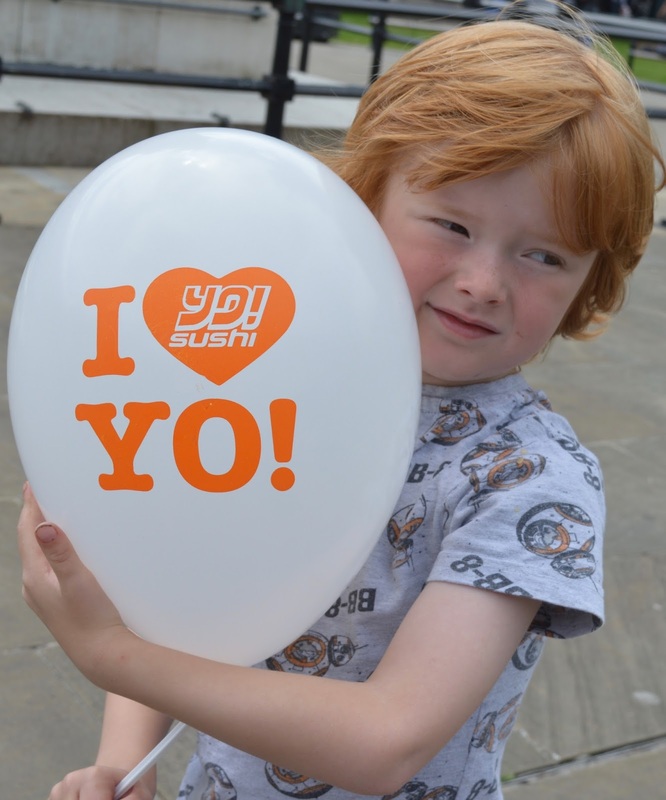 I love Yo Sushi, I bet it's such a fun place to take kids. Never been to a sushi bar before and I've heard great things about yo sushi! The food looks wonderful! I must visit a branch soon!